Okay, not much econ content in this post, but science writer Kyle Hill has put a finger on something that’s always bothered me about the logic of The Walking Dead. In the Walking Dead universe, it turns out that everyone has the zombie virus latent in their system. As a result, death by any cause (for instance, a bullet wound or just old age) can result in reanimation as a zombie. But in that case, why does a zombie bite kill you? If you already have the virus inside you, then getting exposed to more of it shouldn’t be a problem. A zombie bite should be no worse than any other bite. Another possibility is that zombies produce a genuine venom of some sort — a toxin carried by the saliva. But regardless, a bite victim doesn’t actually die from the zombie virus; he dies from something else, and then becomes a zombie for the same reason everyone else does: the zombie virus already in his system. However, this explanation implies that there may actually be hope for the victim of a zombie bite. They’re not doomed to become a zombie any more than the gunshot victim is. If the actual death is caused by bacteria carried in the biter’s mouth, then antibiotics could do the trick. If the actual death is caused by a genuine toxin, then an antitoxin of some sort might work. Either way, this opens up a world of possibilities for saving people and resisting the zombie threat. 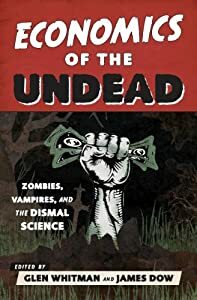 Producers of medical treatments for the zombie venom should see substantial demand for their services (okay, that was my weak attempt at making an econ connection). An introductory video for the web series helpfully informs us that vampires have periods. Indeed, the immortal Carmilla says she’s had over 4000 of them; I guess menopause is not a thing for the undead. Given the intense brand loyalty associated with feminine hygiene products (“women rarely change brands after their 20s,” says one article), their suppliers would be wise to target the vampire demographic. Also, given how much blood is involved in a vampire’s daily existence, I have to think even male vampires might find other uses for these highly absorbent products.